Extension for Adobe InDesign and InCopy CC. Is there a better alternative to Multi-Find/Change? Is Multi-Find/Change really the best app in Author Tools category? Will Multi-Find/Change work good on macOS 10.13.4? 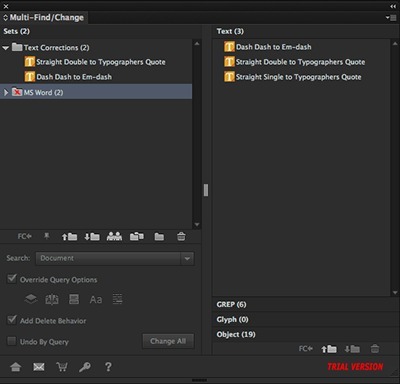 Multi-Find/Change is a scripted plug-in for Adobe InDesign and InCopy (CC) to manage and execute batches of saved Find/Change queries. Multi-Find/Change is the ideal tool for those who rely (or want to rely) on Find/Change queries to correct and/or format text. Multi-Find/Change needs a review. Be the first to review this app and get the discussion started! Multi-Find/Change needs a rating. Be the first to rate this app and get the discussion started!